The effects of picolinic acid (PA) on the intramacrophagic growth of Mycobacterium avium were studied. PA reduced M. avium growth inside mouse macrophages and led to a complete control of mycobacterial growth when added together with IFN-γ. The mechanism involved did not require TNF-α, NO, or the respiratory burst, and was not dependent on either iron or zinc withholding. The mycobacteriostatic activity of the macrophages was associated with the induction of morphological changes that culminated in apoptosis at day 4 of treatment. PA alone induced apoptosis in macrophages, and this effect was increased by IFN-γ treatment. Apoptosis at day 4 of infection was reduced by inhibiting macrophage activation with the prostaglandin 15 deoxy-prostaglandin J2 or by treating the cells with the antioxidant N-acetylcysteine. Mycobacterial growth was partially restored in macrophages treated with PA and IFN-γ when 15 deoxy-prostaglandin J2 was added, concomitant with a delay in apoptosis. N-Acetylcysteine or glutathione could also completely revert the mycobacteriostatic effects of PA or PA plus IFN-γ. Mycobacterium avium is an intracellular facultative bacterium that proliferates inside host macrophages (1). Upon activation by cytokines such as IFN-γ and/or TNF-α, mouse macrophages can cause a limited restriction of the growth of M. avium through a mechanism that is neither dependent on NO (2) or on reactive oxygen intermediates (3, 4), but which may involve iron deprivation (5, 6). In contrast, many researchers have failed to find such a protective effect of IFN-γ when studying M. avium infections in cultured human monocytes (7, 8), despite clinical evidence for a major role of IL-12/IFN-γ pathways in the control of infections by mycobacteria in humans (9). We have previously reported that, in addition to IFN-γ/TNF-α activation, there may be additional signals required to lead to complete control of M. avium infection in mice (10). It is therefore important to study the role of other potential inducers of macrophage antimycobacterial mechanisms. Several studies have shown an involvement of tryptophan catabolism in the antimicrobial mechanisms of the macrophage. During the in vitro activation of human fibroblast and monocytes with IFN-γ, the depletion of tryptophan due to the induction of 2,3-indoleamine dioxygenase is partially responsible for the inhibition of intracellular growth of Toxoplasma gondii (11, 12, 13, 14, 15), Leishmania donovani (12), Legionella pneumophila (16), Chlamydia spp. (12, 13, 14, 17), or CMV (18). Depletion of tryptophan should not affect the intracellular growth of M. avium because mycobacteria are able to synthesize all of the amino acids required for growth (19). The induction of tryptophan catabolism has been reported in patients with cancer (20), in mice infected with influenza virus (21), in AIDS patients (22), and in humans infected with Mycobacterium tuberculosis and Salmonella (23). However, the possible role of the catabolites of tryptophan metabolism as part of the antimicrobial responses has never been seriously considered in those studies. Picolinic acid (PA)3 is one of the naturally occurring degradation products of tryptophan. This molecule is able to form stable complexes with transition metal ions (24), and its chelating properties seem to facilitate the absorption of zinc from the intestine (25) and explain the inhibitory effect of PA in the axenic growth of Escherichia coli (26) as well as in the growth of normal kidney rat cells (27, 28). PA is also tumoricidal in vivo (29), an effect that is related to the induction of macrophage-mediated cytostatic activity (30). The idea that PA plays a role in immune mechanisms is strengthened by the observation that mice treated with PA have enhanced levels of mRNA for IL-1 and TNF-α and higher resistance to Candida albicans (31). In vitro studies with macrophages confirmed that PA is a modulator of macrophage functions because it costimulates macrophage activation and enhances the antitumor activity of peritoneal macrophages treated with IFN-γ (32). In this work, we have assessed the ability of PA to modulate anti-M. avium mechanisms in cultured mouse macrophages. We show that administration of PA to macrophages infected with M. avium induced mycobacterial growth inhibition strongly synergizing with IFN-γ in the induction of complete mycobacteriostasis. A smooth transparent (SmT) variant of M. avium strain 25291 was obtained from the American Type Culture Collection (Manassas, VA). Strain 2-151 SmT and GIR10 SmT were given by J. Belisle (Colorado State University, Fort Collins, CO) and B. Heym (Institut Pasteur, Paris, France), respectively. The mycobacteria were grown in Middlebrook 7H9 broth (Difco, Detroit, MI) containing 10% albumin/dextrose/catalase (ADC) supplement (Difco) and 0.04% Tween 80 (Sigma, St. Louis, MO) at 37°C until mid-log phase. The bacteria were collected by centrifugation, washed in saline containing 0.04% Tween 80, and then resuspended in a small volume of the same solution. The suspension was briefly sonicated until no bacterial clumps were visualized by optical microscopy. The preparation was diluted and frozen in aliquots at −70°C. The aliquots were thawed at 37°C and diluted to the desired concentration before inoculation, according to a previous quantification. For determining numbers of viable mycobacteria, serial dilutions of the suspensions were plated on solid Middlebrook 7H10 agar medium (Difco) supplemented with 10% OADC (5% BSA, 0.06% oleic acid, and 2% dextrose). Bone marrow-derived macrophages were obtained by cultivating bone marrow cells from BALB/c or C57BL/6 mice, obtained by flushing the femurs with HBSS (Life Technologies, Paisley, U.K.). In some experiments, mice genetically deficient in the genes for the inducible NO synthase (iNOS−/−, in a C57BL/6 background), the TNF receptor p55 (p55−/−, in a C57BL/6 background), or the p47phox protein (p47phox−/−, in a mixed 129 × C57BL/6 background) were used. To remove fibroblasts, the cells were cultured overnight on cell culture dishes with DMEM (Life Technologies) supplemented with 10 mM HEPES, 1 mM sodium pyruvate, 10 mM glutamine, 10% of heat-inactivated Myoclone calf serum (Life Technologies), and 10% of L929 cell-conditioned medium. The nonadherent cells were collected with warm HBSS medium and culture for 9 days with L929 cell-conditioned medium until they were completely differentiated, as previously described (3). Peritoneal macrophages were obtained from C57BL/6 mice by injecting them i.p. with 1 ml of 4% of thioglycolate. The peritoneal exudate was collected 4 days later by washing the peritoneal cavity with 10 ml of HBSS. The cells were resuspended at the concentration of 2–3 × 106 cells/ml in complete DMEM and cultured for 2 h for cells to adhere. Then the cells were washed with warm HBSS, and the remaining adherent cells were infected. When necessary, the number of macrophages was determined by lysing the cells with 3% cetrimide (Sigma) and 0.25% Pronase (Sigma) and counting the nuclei in a hemocytometer. A total of 5 × 105 CFU/ml of M. avium strains 25291 SmT, GIR10 SmT, and 2-151 SmT was inoculated in DMEM or in DMEM plus PA (2, 4, 8, 16, 32 mM). The mycobacteria were cultured in 24-well plates at 37°C in a CO2 incubator. Saponin was added to the wells at day 6 to a final concentration of 0.1%, and the cultures were briefly sonicated to disrupt the clumps before serial dilution and plating on Middlebrook 7H10 medium. Each well containing ∼0.5 × 106 macrophages was infected with 0.2 ml of DMEM containing 1–5 × 106 CFU of M. avium for 4 h. After infection, the cultures were washed with HBSS to remove unphagocytosed bacteria. Macrophages from triplicate wells (time 0) were immediately lysed in 0.1% saponin, and serial dilutions were plated in 7H10 solid medium. To test the anti-M. avium activity of PA (Sigma), bone marrow-derived macrophages were treated daily after infection with 2 mM PA, 100 U/ml IFN-γ (R&D Systems, Minneapolis, MN) or PA (2 mM) plus IFN-γ (100 U/ml) until day 3 of infection. Ferric citrate, iron sulfate, zinc sulfate (Merck, Darmstadt, Germany), apotransferrin (Sigma), IL-4 (R&D), and anti-TNF mAbs (clone MP6-XT22; DNAX, Palo Alto, CA) were added after infection, where indicated. Catalase (bovine or erythrocyte; Sigma or Calbiochem, San Diego, CA) or superoxide dismutase (SOD; Sigma or Calbiochem) was added during phagocytosis and after washing the extracellular bacteria in the indicated experiments. N-Acetylcysteine (NAC; Sigma) or glutathione (Sigma) was added to macrophages during infection (10 mM), 1 h after infection at a final concentration of 50 mM, washed away, and then added at days 0 and 1 at a final concentration of 5 mM, where indicated. In the experiments with peritoneal macrophages, IFN-γ (100 U/ml) was added at days 0 and 1, and PA (2 mM) was added until day 3 of infection. The prostaglandin 15d-PGJ2 (Cayman Chemical, Ann Arbor, MI) was added after infection at a final concentration of 6 μM. The mycobacterial growth was monitored by lysing macrophages in triplicate wells up to day 6 of infection. The results are expressed as CFU ± 1 SD of the means. Macrophages infected with M. avium strain 25291 SmT were processed for electron microscopy at day 4 of infection. Macrophages were fixed for 1 h at room temperature with 2.5% glutaraldehyde in 0.1 M cacodylate buffer containing 0.1 M sucrose, 5 mM Ca2+, and 5 mM Mg2+, pH 7.2. The cells were scraped off the culture dishes with a rubber policeman and treated with 1% osmium tetroxide. Postfixation was done in 1% uranyl acetate. After dehydration in ethanol, the samples were embedded in Epon. Sections were stained with uranyl acetate and lead citrate. Apoptosis was studied with different assays. For the use of the annexin V-FITC staining, macrophages were cultured on petri dishes and infected with M. avium strain 25291 SmT. At day 4 of infection, nonadherent cells were collected by aspiration of the medium and adherent macrophages were detached by incubating the dishes with cold PBS containing 0.5 mM EDTA during 1 h. Cells were pooled and washed once with binding buffer (10 mM HEPES buffer containing 0.14 mM NaCl and 2.5 mM CaCl2, pH 7.4). A total of 2–5 × 105 cells was incubated in 100 μl of binding buffer containing 2.5 μl of annexin V-FITC (PharMingen, San Diego, CA) for 20 min in ice. Propidium iodide (1 μg/ml) was added before analysis on a FACSorter flow cytometer (Becton Dickinson, Mountain View, CA) to exclude mechanically damaged cells. To evaluate apoptosis by staining DNA with propidium iodide, macrophages were obtained as described above and were permeated with 70% ethanol for 10 min. After centrifugation, the cells were stained for 20 min at 37°C with 50 μg/ml propidium iodide in PBS containing 100 μg/ml RNase (Boehringer Mannheim, Ottweiler, Germany). Cells were analyzed for propidium iodide fluorescence (DNA content) by FACS. To perform DNA labeling with fluorescein dUTP, macrophages were stained with the APO-DIRECT kit, according to the manufacturer’s instructions (Phoenix Flow Systems, San Diego, CA). Finally, cellular viability was also studied by looking at the mitochondrial-dependent reduction of MTT to formazan, as described before (33). Briefly, macrophages were incubated with MTT (0.25 mg/ml) for 1 h at 37°C, and the formazan was dissolved with DMSO (Merck). The extent of reduction of MTT to formazan was determined by measuring the OD at 550 nm. We tested the ability of PA to enhance the anti-M. avium activity of IFN-γ in bone marrow-derived macrophages from BALB/c mice. Macrophages were infected with the virulent M. avium strain 25291SmT and treated after phagocytosis with PA (2 mM), IFN-γ (100 U/ml), or PA plus IFN-γ daily during the first 3 days of infection. 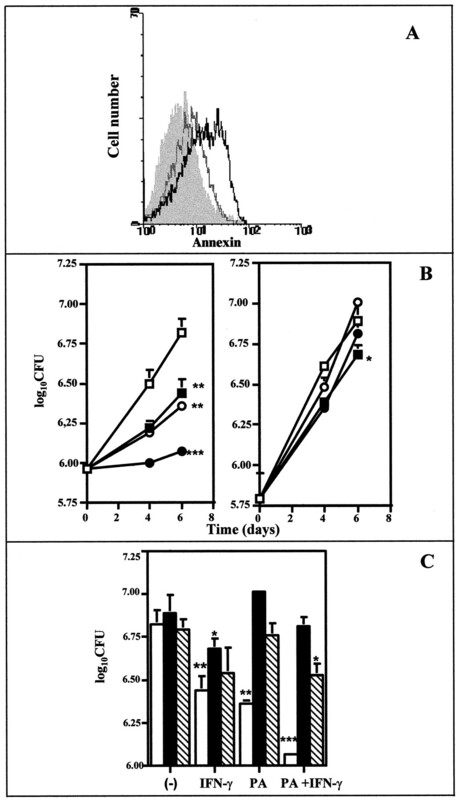 The addition of PA alone to the infected macrophages inhibited the intramacrophagic growth of M. avium measured by CFU (Fig. 1⇓). This decrease was already significant at day 4 of infection (p < 0.05). When PA was added together with IFN-γ, mycobacterial proliferation was completely controlled, as no significant increase (p > 0.05) in bacterial numbers was observed during the 6 days of infection. The same bacteriostatic effect was seen in freshly explanted peritoneal macrophages elicited with either casein or thioglycolate (results not shown). The induction of macrophage antimycobacterial activity by PA was also observed with two additional strains of M. avium (Fig. 1⇓). The effects of PA on the intramacrophagic growth were independent of the sensitivity of the different strains to PA in axenic medium. Thus, although M. avium strain Gir 10 grew 1 log in axenic medium containing 32 mM PA and was 4 times more resistant to PA in axenic medium (IC50 = 4 mM) than strains 25291 SmT or 2-151 SmT (IC50 = 1 mM), the intramacrophagic growth at day 4 of strain Gir10 was reduced by both PA (from 0.37 log to 0.11 log) or PA plus IFN-γ (from 0.37 log to −0.04 log) to similar extents as observed with the two other strains: from 0.52 log to 0.20 log with PA and from 0.52 log to 0.05 log with PA plus IFN-γ for strain 2-151 SmT, and from 0.35 log to 0.24 log with PA and from 0.35 log to 0.07 log with PA plus IFN-γ for strain 25291 SmT, in the same experiment. Complete restriction of growth of three isolates of M. avium is induced by a combined stimulation of BALB/c macrophages with IFN-γ and PA. After infection, macrophages were either not treated (□) or treated daily with IFN-γ (100 U/ml) (▪), PA (2 mM) (○), PA plus IFN-γ (•) until day 3 of infection. Each point represents the mean of triplicate determinations ± SD. Statistically significant growth inhibition is labeled ∗ for p < 0.05, ∗∗ for p < 0.01, and ∗∗∗ for p = 0, according to Student’s t test. The arrest of normal rat kidney cell growth by PA (27, 28) is abolished by the addition of either Zn2+ or Fe3+ (28) because PA interferes with the intracellular levels of these metal ions (27). On the other hand, it has been shown that iron is crucial for M. avium growth (5, 6). Therefore, we tested whether the effects of PA or PA plus IFN-γ could be blocked by supplementation of the culture media with excess amounts of these ions. As shown in Fig. 2⇓, the anti-M. avium mechanism induced by PA was not due to the chelation of Fe or Zn2+ ions, as the addition of either zinc sulfate or iron in two different ionic forms (II or III) did not affect the growth inhibition induced by PA. It is also unlikely that PA acted to prevent binding of iron to transferrin, as an excess of apotransferrin did not revert PA growth inhibition (Fig. 2⇓A). Because the antitumor costimulatory effect of PA is associated with the enhancement of iNOS activity and with increased levels of TNF-α mRNA expression (34), we investigated the role of NO and of TNF-α in the PA antimycobacterial mechanism. We found that there was no difference in M. avium growth inhibition when bone marrow-derived macrophages from iNOS gene-disrupted mice or TNF receptor p55 gene-disrupted mice were used in the experiments and compared with the respective control macrophages derived from mice with similar background (C57BL/6, Fig. 3⇓). In addition, the neutralization of TNF-α with a mAb did not affect the intramacrophagic growth inhibition in macrophages treated with PA or PA plus IFN-γ (Fig. 2⇓). Treatment with IL-4, which inhibits the costimulatory tumoricidal activity of PA (35), did not revert its bacteriostatic effect (Fig. 2⇓). Finally, the addition of catalase or SOD plus catalase did not interfere with PA bacteriostatic activity (Fig. 2⇓), showing that function of the NADPH oxidase is probably not required for the effects of PA. This result was confirmed by using bone marrow-derived macrophages from p47phox−/− mice (Fig. 3⇓), which showed the same ability of wild-type macrophages (from either the C57BL/6 or the 129 strains, although the latter data are not shown) to restrict growth of M. avium after stimulation with PA ± IFN-γ. Exclusion of several molecules as mediators of the mycobacteriostatic activity of PA ± IFN-γ. Bone marrow-derived macrophages from BALB/c mice were infected with M. avium strain 25291 SmT and incubated as described in the previous figure in medium (open bars) or with IFN-γ (light stippled bars), PA (heavy stippled bars), and PA plus IFN-γ (filled bars), in the presence of iron citrate (5 and 10 μg/ml), apotransferrin (Tf, 0.5 and 1 mg/ml), and IL-4 (200 and 400 U/ml) (A), or, in other experiments (B and C), iron sulfate (5 μg/ml), iron citrate (10 μg/ml), zinc sulfate (10 μg/ml), catalase (0.1 mg/ml), SOD (1500 U/ml), or anti-TNF (10 μg/ml). In the experiment depicted in B and C, the iron and zinc salts were added daily, as were PA and IFN-γ. Catalase (0.01 and 0.1 mg/ml) and SOD (1500 U/ml) were added during and after phagocytosis. The effects of the different compounds were compared within each incubation group (controls, IFN-γ-treated, PA-treated, or PA ± IFN-γ-treated macrophages) with the respective control given no compound. Statistically significant differences are labeled ∗ (p < 0.05) or ∗∗ (p < 0.01), according to Student’s t test. Mycobacteriostasis induced by IFN-γ plus PA is independent of NO, TNF-α signaling through p55, or the NADPH oxidase. Bone marrow-derived macrophages of strains of mice genetically deficient for iNOS, TNFRp55, and NADPH oxidase were tested for anti-M. avium activity induced by PA ± IFN-γ. Macrophages from C57BL/6 mice were used as controls for all experiments, and similar data were obtained with macrophages from strain 129 (not shown). Statistics as in Fig. 1⇑. We observed that after 3 days of infection, the number of adherent macrophages, measured by the Pronase-cetrimide method as well as by the reduction of MTT, decreased when the cultures were treated with PA plus IFN-γ (results not shown). PA also induced changes in cell morphology. 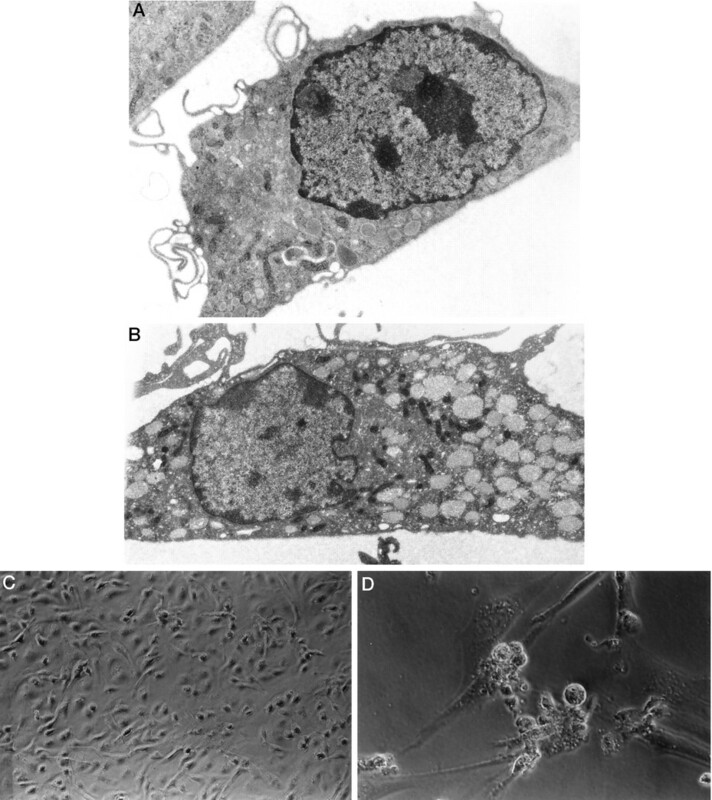 At day 4 of infection, PA-treated macrophages showed numerous small electron-transparent vacuoles in the cytoplasm (Fig. 4⇓B) when compared with nontreated cells (Fig. 4⇓A), and at day 6 of infection there was extensive blebbing of the treated cells, which became fragmented into small vesicles (Fig. 4⇓D), whereas nontreated infected cells had a normal appearance (Fig. 4⇓C). As these changes were morphologically compatible with apoptotic modifications, we measured by FACS analysis the number of apoptotic cells by assessing, as a marker of an early stage of apoptosis (36), the exposure of phosphatidylserine at the outer leaflet of the plasma membrane at day 4 (Fig. 5⇓A) and, as a marker of a later stage, the fragmentation of DNA by propidium iodide staining (37) at day 6 (Fig. 5⇓B). Macrophages treated with PA plus IFN-γ showed clear signs of apoptosis already at day 4 with an increased exposure of phosphatidylserine (29.9% ± 6 of positive cells) when compared with IFN-γ-treated (4.8% ± 0.8), PA-treated (6.9% ± 3.6), or nontreated cells (1.18% ± 0.2). At day 6, the highest percentage of cells with fragmented DNA was seen in macrophages treated with PA plus IFN-γ (58%). PA alone was also able to induce DNA fragmentation, with 18% of the cells showing hypoploid DNA when compared with IFN-γ-treated or nontreated cells. These results were further confirmed by labeling DNA fragments with fluorescein dUTP (results not shown). Morphological changes induced by PA are suggestive of apoptosis. Macrophages infected with M. avium 25291 SmT only (A and C) or treated with PA (B and D) were processed for electron microscopy at day 4 of infection (A and B) or microphotographed in phase contrast at day 6 (C and D). Magnifications: A, ×9,550; B, ×7,580; C, ×160; D, ×325. Extensive apoptosis is induced by IFN-γ plus PA over an extended period of days. Infected macrophages were stained with annexin V-FITC at day 4 of infection (A) or fixed with 70% ethanol and stained with propidium iodide at day 6 (B) and analyzed by FACS. Macrophages treated with hydrogen peroxide (10 mM) or killed at 56°C were used as apoptotic or necrotic controls, respectively. Data presented to date suggest that the effects of PA on M. avium were mediated through the macrophage, by modulating its function. However, they cannot formally exclude a direct effect of PA on the mycobacteria. We therefore tested the effects of either a deactivator of the macrophage, 15d-PGJ2 (38, 39), or an inhibitor of apoptosis, NAC (39, 40, 41, 42). Peritoneal macrophages elicited with thioglycolate, known to express the peroxisome proliferator-activated receptor-γ (PPAR-γ) and to respond to 15d-PGJ2 (39), were infected with M. avium 25291 SmT and stimulated with IFN-γ (100 U/ml, at days 0 and 1), with PA (2 mM daily), or with PA plus IFN-γ. As an indicator of macrophage activation, we analyzed the levels of nitrites in the supernatants from the macrophage cultures. When cells were treated with IFN-γ or PA plus IFN-γ in the presence of 6 μM 15d-PGJ2, there was no activation of macrophages because nitrites were not detectable in the cultures (results not shown). Macrophages treated with PA plus IFN-γ in the presence of 15d-PGJ2 did not show the morphological changes seen in macrophages treated with PA plus IFN-γ in the absence of the prostaglandin (results not shown). 15d-PGJ2 treatment also prevented the induction of apoptosis in cells treated with PA plus IFN-γ, as evaluated by the maintenance of the ability to reduce MTT by the mitochondrial respiratory chain (Fig. 6⇓A) or by the reduction in the exposure of phosphatidylserine (Fig. 6⇓B). The reduction of apoptosis by 15d-PGJ2 in macrophages treated with PA plus IFN-γ was associated with a significant increase in the number of viable bacteria (Fig. 6⇓C). The prostaglandin did not induce any significant changes in the number of intracellular mycobacteria in macrophages treated with PA or IFN-γ, or in nontreated macrophages. The macrophage deactivator 15d-PGJ2 inhibits both apoptosis and mycobacteriostasis induced by IFN-γ plus PA. Infected peritoneal macrophages treated with PA (days 0, 1, 2, and 3), IFN-γ (days 0 and 1), or PA plus IFN-γ in the presence of 6 μM 15d-PGJ2 (▪) or medium (□) were assayed for MTT reduction at day 4 of infection (A) or for intracellular viable bacteria (C). 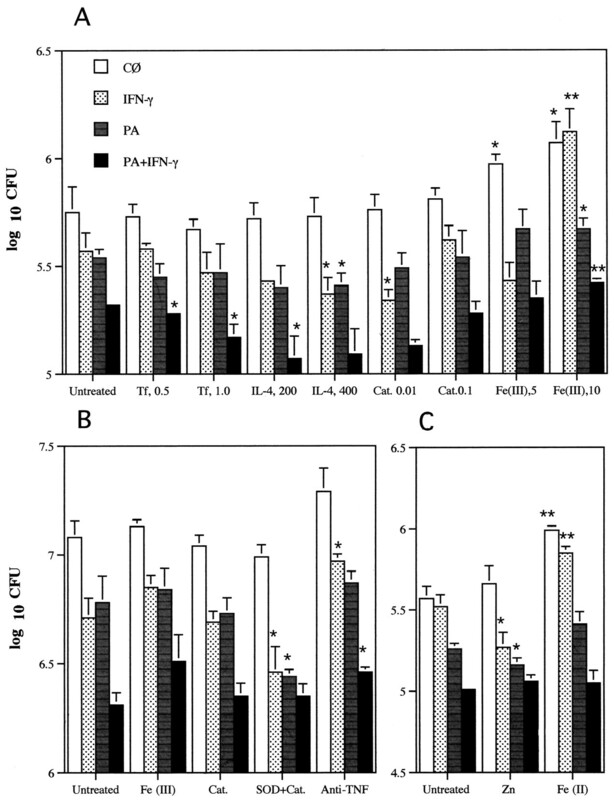 The exposure of phosphatidylserine in macrophages treated with PA plus IFN-γ in medium alone (black line) or in the presence of 6 μM 15d-PGJ2 (gray line) was compared by staining with annexin V-FITC (B). The histograms correspond to cells gated for negative propidium iodide staining. The filled histogram represents nontreated macrophages. Statistics as in Fig. 1⇑. Reactive oxygen intermediate production may lead to programmed cell death, which can be prevented by the antioxidant NAC (40, 41, 42, 43). We therefore tested the effects of this compound on both apoptosis and mycobacteriostasis induced by PA. We found that by adding NAC during phagocytosis (10 mM) and after phagocytosis (50 mM) during 1 h before treatment with PA of bone marrow-derived macrophages, we could reduce apoptosis as measured by exposure of phosphatidylserine at day 4 of treatment with PA plus IFN-γ (Fig. 7⇓A). Furthermore, we completely reverted the effect of PA and PA plus IFN-γ in the inhibition of M. avium growth inside the macrophages with the NAC treatment (Fig. 7⇓B). Addition of glutathione was also effective in reverting the mycobacteriostatic effect (Fig. 7⇓C). The inhibitor of apoptosis, NAC, prevents the induction of mycobacteriostasis by IFN-γ plus PA. A, Exposure of phosphatidylserine was analyzed by staining the cells with annexin V-FITC. 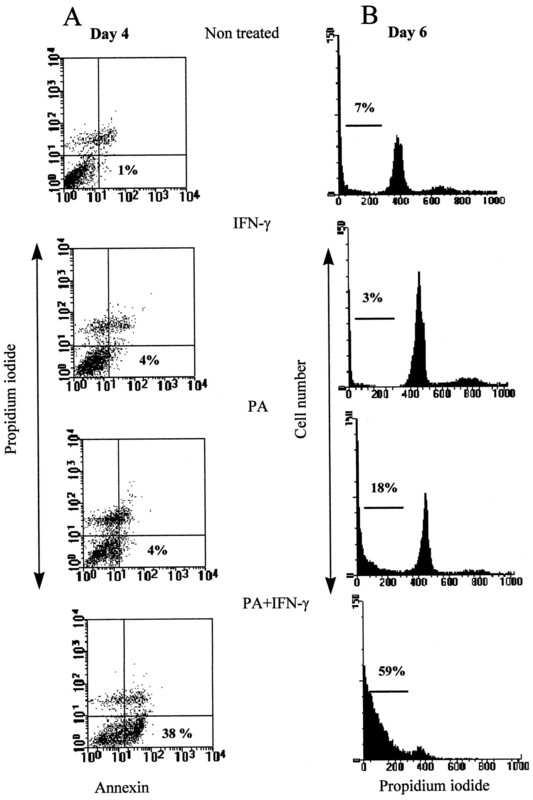 Histograms represent macrophages treated with PA plus IFN-γ in medium (black line) or macrophages that had been with NAC before and during treatment with PA plus IFN-γ (gray line) after gating on cells excluding propidium iodide. B, Effects of PA or PA plus IFN-γ on the growth of M. avium strain 25291 were compared between macrophages cultured in medium (left) and macrophages treated with NAC (right). C, Effects of two different antioxidants in the inhibition of bacteriostatic activity of PA. M. avium CFU were determined after 6 days of culture with the indicated stimuli in the absence (□) or presence of NAC (▪) or glutathione (▧). Statistics as in Fig. 1⇑. We have shown that PA, a terminal catabolite of tryptophan, induced anti-M. avium activity in murine macrophages and synergized with IFN-γ, leading to complete mycobacteriostasis. All three strains of M. avium tested to date had the same degree of susceptibility to the mycobacteriostatic effect of PA and PA plus IFN-γ in macrophages, independently of the susceptibility to PA in axenic medium. Also, the growth of the Gir10 strain was not arrested in axenic media with concentrations of PA up to 32 mM, whereas this strain was as easily controlled by activated macrophages treated with PA as the other two strains of M. avium. These data strongly argue against a direct effect of PA on mycobacteria, but suggest an effect mediated through the macrophage. PA is able to chelate metal ions. However, iron or zinc withholding was unlikely the cause of restriction of M. avium growth inside macrophages treated with PA or PA plus IFN-γ. Not only was the addition of the ion metals ineffective in reverting the bacteriostasis, but also the inhibition of the growth of M. avium induced by PA plus IFN-γ was higher than the one obtained with other iron chelators (4). As previously shown by Varesio and coworkers (34), PA is also a macrophage agonist leading to higher secretion of cytokines such as TNF-α and of NO. In the system described in this work, however, TNF-α was not involved in modulating mycobacterial growth inhibition following PA stimulation, as either the neutralization of the cytokine with specific mAbs or the use of bone marrow-derived macrophages from TNF receptor p55−/− mice failed to have an effect in the macrophages’ anti-M. avium activity induced by PA or PA plus IFN-γ. Finally, neither oxygen-reactive species generated by the NADPH oxidase nor NO was mediating growth inhibition after stimulation of macrophages with PA or PA plus IFN-γ. Instead, we have found a new anti-M. avium macrophage effector mechanism that is concomitant with the induction of apoptosis and that could only be reverted by blocking programmed cell death. Others have shown that human monocytes infected with M. avium and treated with hydrogen peroxide enter apoptosis after 6 h with concomitant bacterial killing (44). Furthermore, bacillus Calmette-Guérin and M. tuberculosis were also killed in human monocytes a few hours after the apoptotic stimulus given by ATP (45, 46) or Fas-L (47). The induction of apoptosis and mycobacteriostasis in murine macrophages by PA plus IFN-γ had different features from the previously described. We did not observe bacterial killing, but rather an inability of M. avium to grow in treated macrophages. This is more consistent with what is generally observed in vivo, in which killing of M. avium is seldom seen and when it occurs it takes place throughout a protracted period of weeks rather than hours. While the restriction of M. avium growth was observed from the early time points of treatment with PA or PA plus IFN-γ, apoptotic changes of the phagocytes were only detected later, starting to become prominent at day 4 of infection. This suggests that the mechanism leading to mycobacteriostasis occurs in parallel or is the same that will result in the programmed cell death pathway, and that mycobacteriostasis is not a consequence of the late cellular apoptotic changes. A final argument against a direct role of PA on the inhibition of M. avium growth inside macrophages comes from the ability to abolish its effects by preventing apoptosis of the macrophages. Although the three agents used for that purpose, 15d-PGJ2, NAC, and glutathione, have pleiotropic effects, their actions are concordant regarding the inhibition of apoptosis, making it less likely that the effects observed were due to other biological effects shared by these different molecules. This strongly suggests a link between the mycobacteriostatic mechanism and that of programmed cell death. In addition, the bacteriostatic and apoptotic effects of PA plus IFN-γ were closely dependent on the activation of macrophages by IFN-γ because the mechanism was reverted by the prostaglandin 15d-PGJ2 in thioglycolate-elicited macrophages. By binding to PPAR-γ, 15d-PGJ2 has been shown to block expression of genes mediated by transcription factors associated to inflammatory changes such as AP-1, NF-κB, and Stat1 (38). Although the known consequence of the activation of PPAR-γ in macrophages is the inhibition of the expression of genes such as those coding for gelatinase B, TNF-α, and iNOS (38, 39), we observed that another effect was the inhibition of apoptosis. As a role for TNF-α and NO in the expression of the PA treatment had been excluded, we feel that the inhibition of apoptosis is the cause of the abolished anti-M. avium activity. In addition, whenever we failed to revert the mycobacteriostatic effect induced by PA plus IFN-γ, e.g., by supplying metal ions, reactive oxygen scavengers, or cytokine modulators, or by using the macrophages from the gene-disrupted mouse strains, we also failed to detect any differences in the morphological alterations described in this work. The mechanism whereby PA triggers apoptosis is not clarified, but it could involve the generation of reactive oxygen species or an alteration of the cytoplasmic redox potential, as suggested by the results obtained with NAC and glutathione (48, 49). NAC is a thiol compound that can act either as a hydroxyl radical scavenger or by increasing the intracellular levels of glutathione, which protects the cell against oxidative damage. Although the addition of catalase or catalase plus SOD did not revert the bacteriostatic effect of PA in our studies, NAC blocked the mycobacteriostasis induced by PA and PA plus IFN-γ probably because of its antiapoptotic effect. A role for NAC in blocking oxygen-reactive species generated by the NADPH oxidase with the consequent inhibition of mycobacteriostasis does not seem plausible because no differences were found when p47phox-deficient mice were compared with wild-type controls. Also, no evidence exists to suggest that oxygen-reactive species generated outside the phagosome (e.g., the cytosol or the mitochondria) may lead to mycobacterial growth restriction inside their vacuolar location. It has been reported that iron (III) picolinate catalyzes the production of hydroxyl radical in the presence of superoxide radical and hydrogen peroxide (50). Even though the addition of catalase or SOD plus catalase did not revert PA or PA plus IFN-γ effect, it is possible that the enzymes did not reach the site in which O2− and H2O2 are formed, presumably intracellular. A localized production of the hydroxyl radical could initiate lipid peroxidation and cell damage with subsequent apoptosis (46). On the other hand, reactive oxygen species also act as second messengers in the activation of NF-κB (51), a trancription factor that is associated with transduction of proapoptotic signals in different cells (52, 53). As 15d-PGJ2 and NAC can inhibit activation of NF-κB (38, 51, 54), we postulate that activation of NF-κB in macrophages treated with PA and PA plus IFN-γ is central for both apoptosis and induction of mycobacteriostasis. IFN-γ clearly enhanced the apoptotic and bacteriostatic activity of PA in infected macrophages. That effect is not a combination of two separate anti-M. avium activities because in thioglycolate-elicited peritoneal macrophages, the activity of PA plus IFN-γ was reverted by 15d-PGJ2 without disturbing the activities of PA alone. Interestingly, IFN-γ is a cytokine that may inhibit cell growth and induce apoptosis (55, 56). Furthermore, a defective Stat1 transcription factor in U3 cells inactivated IFN-γ signaling and decreased the constitutive expression of caspases (57). Activation of macrophages with IFN- γ could prime the cell to the apoptotic effect of PA. The dissection of the transduction signals involved in this mechanism could bring important information to the understanding of the antimycobacterial mechanisms. In summary, we describe a novel pathway of mycobacterial growth control that is triggered by PA in IFN-γ-activated macrophages and that is related to changes occurring during the programmed cell death of the host cell. This pathway does not involve previously described effector mechanisms such as the respiratory burst or NO. We thank Drs. J. Mudgett, C. Nathan, and J. MacMicking for supplying breeders of iNOS−/− mice; Dr. Tak Mak for supplying breeders of p55−/− mice; Drs. Steven Holland and Brahm H. Segal for the gift of p47phox−/− mice; DNAX for the anti-TNF hybridoma; and Dr. M. T. Silva, Ms. Paula Macedo, and Ms. Irene Barros for help with the electron microscopic analysis. ↵1 This work was supported by Contract P/SAU58/96 from the PRAXIS XXI Programme (Lisbon). T.F.P. received a fellowship from the PRAXIS XXI Programme. ↵3 Abbreviations used in this paper: PA, picolinic acid; 15d-PGJ2, 15 deoxy-prostaglandin J2; iNOS, inducible NO synthase; NAC, N-acetylcysteine; PPAR-γ, peroxisome proliferator-activated receptor-γ; SmT, smooth transparent; SOD, superoxide dismutase. Ratledge, C. 1982. Nutrition, growth and metabolism. In The Biology of the Mycobacteria, Vol. 1: Physiology, Identification and Classification. C. Ratledge and J. Stanford, eds. Academic Press, London, pp.183–271. Bailar, J. C., Jr. 1956. The Chemistry of the Coordination Compounds Reinhold Publishing Corp., New York.